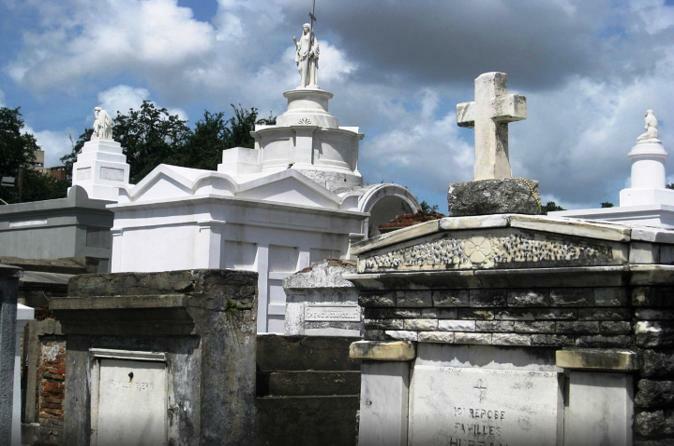 New Orleans’ past and present cultures merge most intriguingly in its cemeteries, so there's no better place to learn about the city's remarkable history and relive the stories of its people. This tour combines two of New Orleans' most interesting curiosities ― death and Voodoo ― into one fascinating 1.5-hour journey. Make your own way to Toulouse Street in the French Quarter, where you'll join a guide on a haunting stroll through New Orleans’ oldest cemetery, St. Louis No. 1. See the interesting architecture that represents New Orleans' unusual burial methods, learn about the ways in which the city's been memorialized within the graveyard's walls, and enjoy an enchanting and informative walk through the area's local history, including the many ironies and tragedies that have shaped its culture. You'll also visit the final resting place of one of New Orleans' most intriguing residents ― Marie Laveau ― and delve into the misunderstood practice of Voodoo, exploring its West African origins and Catholic influences. Along the way hear fascinating tales of the city's most interesting characters and see sites where mystical Voodoo rituals still take place.